Sounds like a good choice. I like the standby power consumption of only .07 watts. Now your biggest problem will be to pry yourself away from the TV so you can put together more brilliant articles about energy conservation. Any ideas about capping the BP oil spill? I've actually been trying to learn more of the details about the spill and deep water drilling. www.TheOilDrum.com appears to be a good place with lots of industry folks commenting. It does seem like there ought to be a simple way to to get it plugged or to capture the oil. I guess the hard part (aside from 5000 ft of water) is that the pressures are massive -- it looks like pressures up to 15,000 psi are possible during this Top Kill operation -- that's 5 times the pressure of the high pressure hydraulic systems in airplanes. The more I read about the deep water drilling the more I think that in spite of all the technology to try to manage the risk its just a very high inherent risk operation -- maybe something that's just not worth it. Sharp is a good choice for a TV. I bought a Sharp LC37... a couple of years ago. 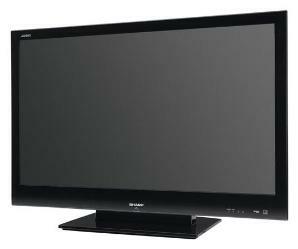 The main factors were energy star rated and it had the best picture quality (to my eyes) than other TVs in the same class. I don't watch very much TV, but do like the odd movie.